I slide the box of gear across the counter and say goodbye to my broken phone, a battery pack, hard drive, poncho, snow baskets, and the ten foot long scarf I picked up in Germany to wrap around my head in winter. I could have sent more – my down jacket, my tent, my sleeping pad – but it’s hard to strip away things that are as familiar as skin. The Camino feels empty when I return to it. Everyone left Pamplona hours ago as I drifted around the city running errands. I pick up the trail near the city’s walls and walk west through the maze of streets, following signs and strangers’ pointing fingers to the edge of town. As the city falls away behind me, the trail stretches forward, a broad white line through green fields, rising slowly toward a low pass. A war of light and shadow rages in the north, distant rain falling in sheets, patches of sunlight sliding across fields. I watch it as I walk, hoping it won’t turn. In the distance, I see a man with a backpack, two bright white shoes hanging off the back. I pick up my pace, running through the catalog of equipment and people I’ve met so far – grey pack, white shoes, white hair, dark blue jacket – and coming up empty. I catch up on a climb and stumble through a Spanish greeting. He stumbles over a Spanish response. Then we both realize we’re Americans and switch to English. “I’m Clement,” he says, reaching out to shake my hand. I ask if he wants to walk together for a bit. He warns me that its his first day and they don’t have hills like this where he’s from in South Carolina. I shrug. The miles come easy here and I’m not in any rush. “Closest thing I had to train on was walking up a bridge,” Clement says. I laugh. Clement’s accent reminds me of home and growing up in the south. He’s first-day tired, but his eyes light up when he talks as if the excitement of being there, of starting this journey after so long thinking about it, is spilling out of them. All the books, all the reading, the planning, the decisions, brought him to this moment. “You really walked up bridges?” I ask. He nods and we both laugh. We begin the slow, draining climb towards Paso de Perdón. I watch the struggle on Clement’s face as we walk. Nothing comes easy for him. He can feel the weight of his pack on his shoulders, the climb in his legs, the effort in his lungs. I know because I can see it, because I’ve been there. But he doesn’t complain, he seems to accept it, and there is joy there too, underneath it, an embrace of the challenge, of the earned view back toward Pamplona as it shrinks away, of the light and dark mosaic of clouds moving across the distance. We talk and share stories, bits of my life mixed with bits of his. I try and talk more, to let him save his breath for the climb, but Clement is a better story teller than I am and I find myself listening and waiting for the next tale as much as talking. 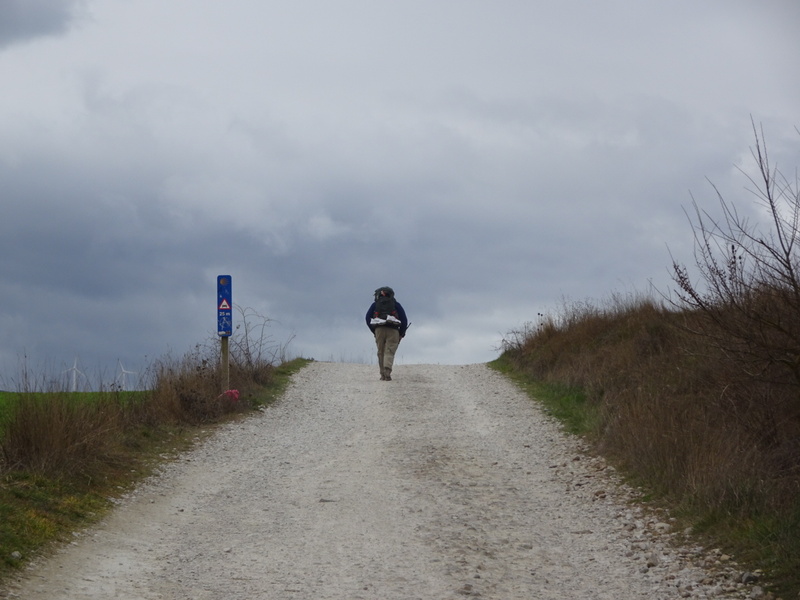 I tell him about the post office and the first days of the Camino. He tells me about throwing things out in the hotel the night before, getting rid of everything he doesn’t need. I smile and glance at the white shoes hanging off the back of his pack. The last 250 days fly through my mind, the Arctic Circle, Germany, the Alps. There is a reason it’s easy now, two hundred and fifty of them. He has minutes to my days. We are 4,600 miles apart even though I could reach out and touch him. He stops for a moment to catch his breath. I stop with him, glancing at the rain falling in grey sheets to the north as we talk. I try to catch the direction of the clouds. Are they moving towards us or sliding by? It rained so much in Norway, what was it, eight of ten days? Germany was better, mostly, but when it did rain it was bitter cold. I stop staring at clouds and look at him catching his breath, taking his steps, spilling out a secret most people keep buried deep. There were doubts in Saint Jean Pied du Port too, the air was thick with them that night, but no one said anything there. No one had Clement’s honest courage, not out loud anyway. I look at his new pack, the white shoes dangling off the back. I think of the year and a half he planned for this day. I think of him sitting in his hotel room about to quit before the first step. I think of Norway, of Alta, of the rain as I hitched toward the northern tip of Europe. I remember how cold it was then, how the rain kept coming, how my soaked tent dripped water on me in the night and I couldn’t stop it. I remember standing by the road in the morning, my wet bag, my wet clothes, my skin cold, my muscles shivering. I felt so alone there, so very alone. I remember fear flooding over me. The deep, crushing fear, not of death, not of cold, not of mountains or snow, but of failure. I can’t do this, I thought. What have I done, coming out here? I don’t have the answers. I am a fool and a fake. I should go home. I can stop it all right now if I never start. I won’t fail if I never reach the beginning. I remeber that I could barely hold my thumb out for a ride. I stood by the road for two hours in the rain. Miserable and wet, I told myself I would quit in another hour. Then the woman in pink stopped. She turned the heat on and blasted it over me as we drove across the Arctic toward Lakselv. I held my clawed hands to the rushing air until they uncurled and my clothes begin to dry. She barely spoke a single word, she only blasted the heat, smoked a cigarette, and drove, refusing to let me quit there on the side of the highway before I even began. I look at the land rising to the pass, at the storms drifting closer, at Clement. The dark grey sky shifts and moves in the distance. Cracks of light open between sheets of rain. The front is moving, flying across the north, sliding towards us. If it turns, the day will turn with it, turn bad, turn into the cold, nasty rain that once grabbed my will by the throat. I’d laugh at it now, laugh at it for even trying. Rain is not my demon anymore, but I think of Clement in his hotel room last night, of the frailty we all feel at the edge of our abilities, when we stretch into something unknown. I think of the courage it took for him to be here in this moment, out on this trail, walking into the rain. And I think of the lady in pink, I think of her cigarette glowing between her fingers, of the heat blasting through the car, of the Arctic flying past as we drove north. She isn’t coming today. Not for me, not for Clement. “You have a rain fly in that pack?” I ask as the first drops begin to fall. He does, but it’s buried somewhere deep. Rain beads off the fabric of his backpack. The pack is new so it will keep most of the water off, not all, but most. “Anything that can’t get a bit wet?” I ask. Clement shakes his head and pats the phone in the pocket of his rain jacket. “The rest can get wet,” he says. He looks at peace with it, not scrambling for the pack cover, not worried, just accepting it for what it is, a lesson. “I won’t forget that again,” he says. I grin at him. Grey sky swallows the light. Sheets of rain slide over us as we climb, cold rain, almost ice. It feels familiar on my skin, soaking into my beard, beading off my jacket. I look at Clement, watching him as he walks, as he stops to catch his breath, as the trail throws freezing rain at him on the first morning. I was wrong about the 4,600 miles between us. We aren’t apart at all, we are standing there together, side by side, the same rain falling on our skin, the same mud sliding under our shoes, the same pass closer with each step. It is the two of us against the rain. I wouldn’t trade the moment for any. Clement never waivers, not once, not for a moment. A few hundred feet from the pass, he stops me. “Listen to that,” he says. The two of us stand there, silent in the rain, listening to the windmills spinning in the wind. The blades slice through the air, cutting it with a rushing whoosh, whoosh, whoosh. “Isn’t that beautiful,” he says. I grin at him. I stop worrying. I smile up at the sky, at the rain falling on my cheek, at all the doubt that flowed through me in Norway, through Clement in Pamplona. The rain falls. The wind roars. The blades spin above us as we walk the last steps to the pass. Whoosh. Whoosh. Woosh. I’m going to be alright too. Beautiful, humbling and moving! We are all in this together! One soul moving along, moves us all. Really nice, Daniel. Clement’s story, you’re awareness. One of your best. Thanks for this. Thank you so much for this. Clement is my father. He told us about your blog. It’s wonderful to hear another perspective of his journey. Thank you for looking after him. Tell him his daughter Brooke says hi! I am Clement’s wife and this entry makes me even more proud of him. And it makes me miss him even more; if that’s possible. I have so enjoyed your blog. This post really moved me. Your wisdom from the trail is so worth sharing. Thank you for it, your awareness, your openness, your humanity. Lovely D. Clement’s courage is one of those moments of life at its best and you do an amazing job taking us there so we can share. Great post. Thank Clement for his honesty too. Anybody who hasn’t felt those doubts hasn’t really pushed themselves, hasn’t tried to achieve something big, or at least big to them. It’s nuce to hear someone willing to admit it, especially at the beginning when failure seems most real. What a beautiful story. Bravo Clement! And you, full of empathy for him, compadres. With your history of trail angels, the lady in pink and many more, you now take that role on for fellow pilgrims on the Camino. Blessings Be! I applaud both of you! Keep on keeping on! Beautiful story about your day with Clement. You soooo connect with your audience when you share your inner feelings! We have all been there at some point in time in our life. Namaste. This intimate moment in today’s story captures the human experience…within all of us there is undiscovered strength abiding side by side with our weakness and self-doubt. And with each day, with each human experience they struggle as we long to see which one prevails, often as bystanders to our own existence.